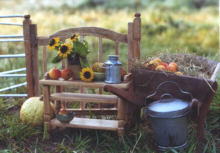 A calendar with rural stillives inspired me some years ago to do such photography with miniatures, dollhouse furniture and small real fruits. 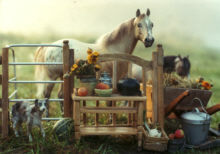 Every year I am looking forward to autumn to take such pictures. 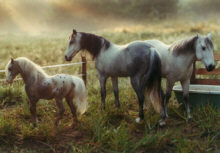 Here a scene on the meadow with two andalusians sculpted by myself and a pony resin. 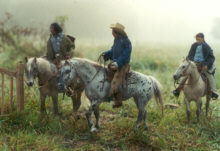 The place were I do these photos I call Silver Valley because rising fog on autumn mornings gives a special lighting to it. 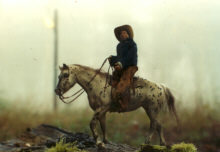 This is LBR Waymore's Ladybug, an appaloosa mare sculpted by myself at Silver Valley. 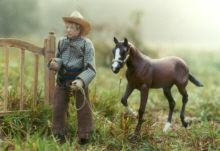 This is horse whisperer Tom with a quarterhorse filly sculpted by Heike Polster.